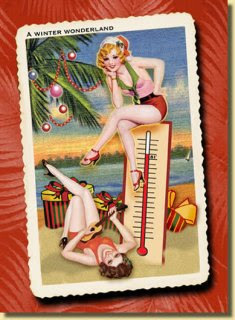 Have a marvelous New Year and we will see you in 2009! Feeling a little too winter white? At this time of year, that beautiful beach glow that we all love tends to fade. I found myself needing a little of that glow back for one of the Holiday parties I was attending, especially for my Lily white legs. 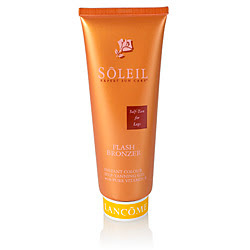 Lancome came to the rescue with it's Flash Bronzer for legs. I was ready for my event in a couple of days. It's great to mix with your favorite moisturizer to get a very suttle look. Make sure to exfoliate very well before use and add a little extra moisturzer on your knees and around your ankles to assure an even look. Don't Let Winter Skin Make You Dull! At this time of year, our skin tends to be under a little more stress.....with the dry air and cold temps, we can look a little dull. 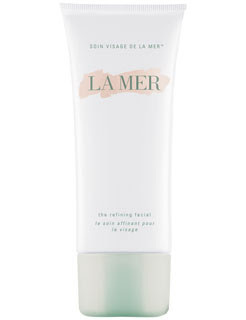 La Mer is one of the most luxurious skin care lines on the market and their refining facial is a must have! This product will keep your skin fresh and fabulous all winter long. It is a great refresher a couple of times a week or use it on a daily basis mixed with your favorite cleaner. We have had alot of calls and emails about our seminars and wanted to give you all an update! We have decided to jump start the new year with our series that will continue throughout 2009! They will still take place every 3rd Wednesday evening, with emails and invitations going out to remind everyone. SO...no seminar this month, but we will start the New Year off with a bang!! This is the line up so far...please email us with ideas on other topics you may want to see covered! Also, our new site is chugging along. Dan is working hard at getting us the first draft template, so we hope to announce that our site is up and running soon! We look forward to hearing from you and we will see you all next month! One of our favorite Make Up Artist is Carmindy! We love her!! She is all about giving yourself permission to look good and feel great. She inspires woman all over the world to be the best they can be, so what's not to love about her right? We collect other artists books for obvious reasons, but rarely make the suggestion that one is good enough to actually go out there and buy....well, her new book should be on every gal's wish list. It's beautifully published with very practical and easy tips to understand (and try out). Check it out at your local Barnes & Nobles, Target, or go on Amazon.com...it's a great gift for any Mom, Sister, or Gal Pal! !